Hopefully, over the years, I haven’t given you the wrong impression about birders. But just in case, let me clear something up. Most of us are not one-dimensional and obsessed. We are not like the Owen Wilson character in “The Big Year.” Occasionally we think about things that don’t wear feathers. In fact, I once met a birder who had a second hobby. He called it photography. When not birding he took nice pictures. Of birds, mostly. Seriously, the more I hang out with birders the more I witness people who are fascinated by the natural world. They love nature and love being outside. Birds are No. 1, but we are easily distracted. 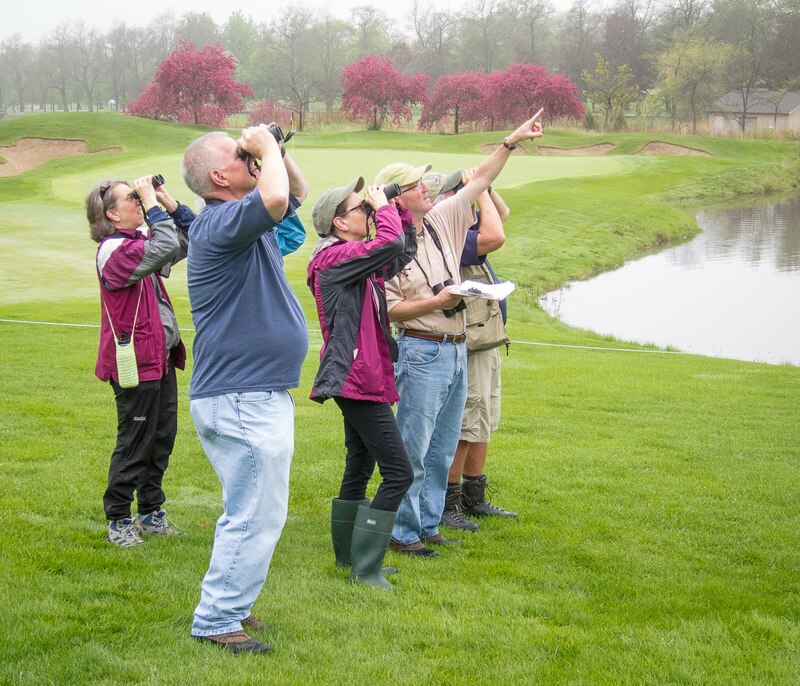 So I was not surprised that plenty of birders turned out for the June 27 “Centennial BioBlitz” conducted by the Forest Preserve District of DuPage County. The 24-hour event brought together scientists and citizen scientists to help District ecologists identify and catalog plant and animal species in four DuPage preserves: Blackwell, Danada, Herrick Lake and St. James Farm. It was a major undertaking, to say the least, and the first field work of its kind in the DuPage preserves. BioBlitz results are still being tabulated and I’m eager to see them. Odds are good that some species not previously known to exist in DuPage or even Illinois were discovered. No, not bird species. We couldn’t realistically hope for that. The birding teams were just out to enjoy a fun morning of doing what we love in the name of “citizen science.” Our job was simple: take inventory, keeping a list of species and noting the ecosystems where we found them (woodland, marsh, prairie, etc.). I joined a team covering St. James in Warrenville, where we found about 60 birds. Highlights were Acadian flycatcher, hooded warbler and veery, all presumably nesting within the 600-acre preserve. Two scarlet tanagers brightened our day as well. At the lunch tent I happened upon Bill Murphy, a research collaborator with the Smithsonian Institution and one of the world’s leading authorities on snail-killing flies. He’d traveled from his Indiana home to participate in the BioBlitz and showed me a vial of flies he’d collected for later study. Until the BioBlitz the presence of snail-killing flies in DuPage had never been documented. Cool stuff! Compared to most BioBlitzers, we birders had it easy. Think about birds and bugs. The world contains 10,000 kinds of birds, about 300 of which can be found in Chicagoland during the calendar year. There are an estimated 1 million insect species with new ones being discovered all the time. The beetle family alone includes nearly 300,000 species and most are never seen! I think I will never again gripe about sorting out the “confusing fall warblers,” an annual ID challenge involving a handful of alternate-plumage songbirds. And I won’t complain when a singing bird (like the hooded warbler I mentioned) chooses not to reveal itself. These are small frustrations and just part of birding. It could be worse. We could be sweeping a net through marsh grasses, gathering thousands of tiny bugs and then trying to identify them later under a microscope. I’m not sure that’s the exact process but I’m certain that watching birds is more on my level. BioBlitz participants, at least for a day, seemed to possess a heightened awareness of all living creatures. We cared about what each other and what everybody else was finding. On one grassy trail we noticed a shiny green beetle, the kind of spectacular bug you might see inside a block of Lucite on a CEO’s desk. A fellow birder thought it might be a tiger beetle. Sadly, our team didn’t encounter a single monarch on June 27. Their current scarcity is painfully obvious. We did, however, encounter another striking orange butterfly, the great spangled fritillary. Lots of them, apparently freshly hatched, were nectar shopping in St. James’ summery meadows. 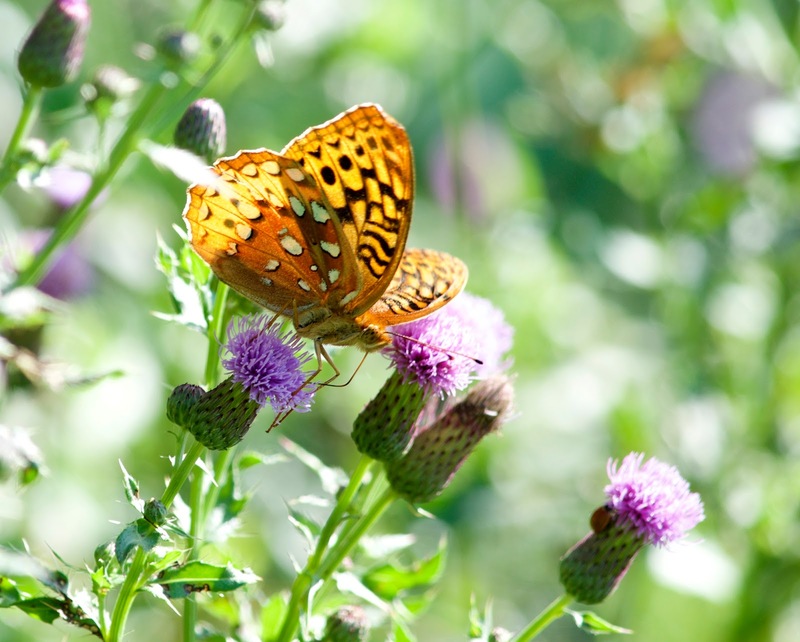 Butterflies are not just a pleasant distraction. As a kid, they meant more to me than birds. I knew them all, and the big showy moths, too. I captured them and stuck pins in their bodies. Those framed collections are long gone, and I can still smell the mothballs. The day after BioBlitz I went to Greene Valley Forest Preserve in Naperville, to the “scenic overlook.” The scenery I had in mind was of the avian kind, a lingering loggerhead shrike first spotted on the hill about a week earlier. I arrived an hour after its latest reported appearance. Then I waited. And waited. I never did see the shrike. When rare birds see me coming they tend to scatter. However, those butterflies, plus a singing eastern meadowlark, made the visit worthwhile. We don’t always “get the bird,” but the hours we spend in nature are never wasted.